After more than a year of active planning and several years of dreaming, our African safari has become a reality. It's hard to believe we have been there and back already! The two weeks went by with the blink of an eye. 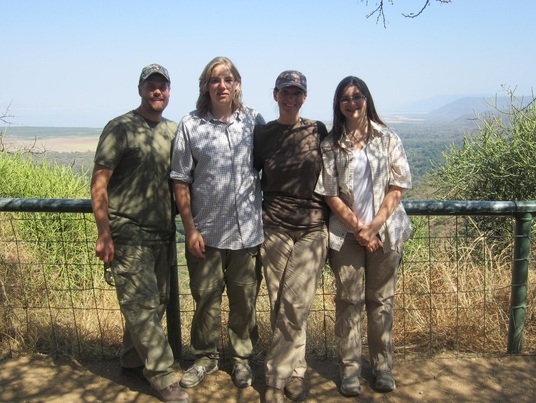 I remember many, many years ago when our kids were babies, talking about the day that we would do a safari as a family. We travel a lot, and we always knew we would do a trip like this together. We even took the kids on smaller adventure trips closer to home to see how they would do. No surprise to us, they loved the adventure and wildlife as much as we did! So now, with our kids young teenagers, the timing is perfect and the stage was set for us to begin an adventure of a lifetime. I knew for a long time that we wanted to visit Tanzania. 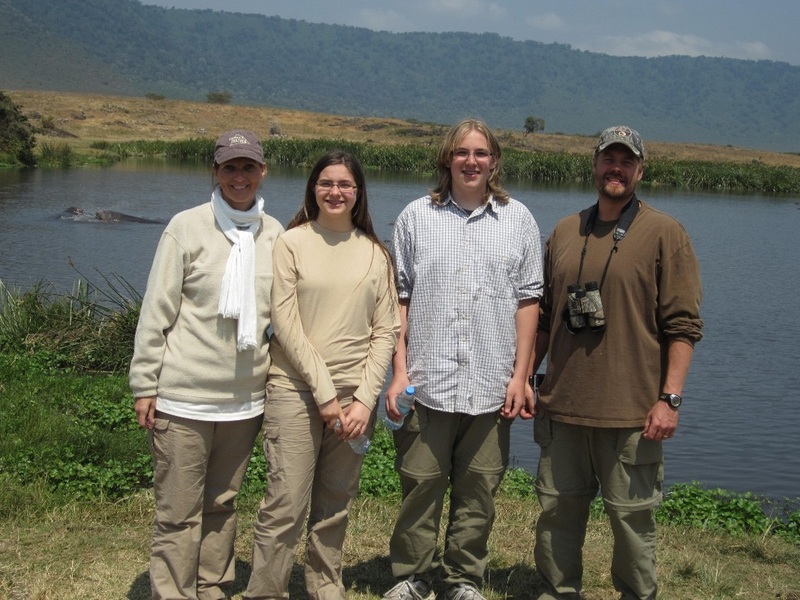 The richness of the wildlife and variety of activities Tanzania has to offer are perfect for us. 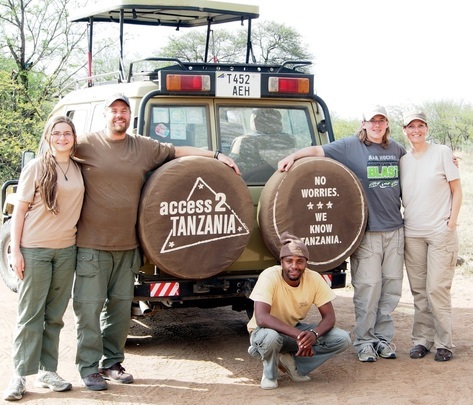 Access2Tanzania is a Minnesota based company that also has an office in Arusha. After some emails and phone calls, I knew that they were the perfect ones to handle the customization of our safari plans. The last thing we wanted was to be put on a truck with a dozen other travelers from around the world. This trip was special. It was unique and intimate and something that we wanted to experience together as a family, just us. Access2Tanzania provided exactly what we had in mind. We had a private guide, a private safari vehicle, and a perfect blend of accommodations for the two weeks that we were in Africa. Casey at A2T listened closely while I described what I had in mind. He helped fine tune the lodges and suggested some things that he thought would be good to include that I hadn't thought of. Pretty funny that I, a travel agent, hired another travel agent to book our trip! It just proves the value of using an experienced travel professional. I simply could not have asked for a better partner to help me plan this trip. What's the price tag, you ask? It was worth every penny of the $4000 per person for the safari portion of our trip, not including airfare, immunizations, travel visas, tips and drinks. Would we do it again? In a heartbeat!!! It is definitely not a "once in a lifetime" trip! Our flight lifted at 2:50pm on Wednesday, July 2. We flew 8.5 hours to Amsterdam, had a 4 hour layover, then flew another 8.5 hours to Kilimanjaro. We landed on Thursday at about 8pm. We were exhausted from the flights, and a little nervous to be in Africa but super excited to get the adventure started. We followed the crowd and got in line to purchase our travel visas. A little paperwork and four crisp, new $100 bills and we were in. We found our luggage in the small baggage claim area and headed out towards the parking lot where we were to look for our guide. Danny was there, holding a "Nornes" sign and looking for us. Casey told us our guide's name a few weeks before we left, but other than viewing his profile on the A2T website, we didn't know much about him. I had asked Casey for a little info on Danny so we could bring an appropriate thank you gift or two with. We were going to be spending a lot of time with Danny and thought that something personal would be nice in addition to the tip we would give him. So, it was exciting to meet him and get the safari started. We piled our gear into the back of the A2T Toyota Landcruiser we'd call home for the next 10 days and headed off to Arusha. Because of the long flights and our late arrival time, we decided to stay an extra night in Arusha to help us acclimate to the time change. The African Tulip is a luxury, boutique property with a lovely restaurant and lounge, pool and super spacious rooms. We had a family suite (rooms 21 and 22) which consisted of two bedrooms, two bathrooms and a full living room. We were very comfortable and got a great night's sleep. Feeling better after sleeping laying down flat instead of an airplane seat, we were ready for some sight-seeing. Danny arranged to pick us up for an afternoon of shopping and errands. First we stopped at the money exchange to get Tanzanian Shillings. One US dollar equals approximately 1600 Shillings. A can of Coke was about $500 TZS, or about $0.30 USD. The money exchange was located downtown, and was it was definitely a crazy busy, "downtown!" There were people everywhere, cars, motorcycles, buses and carts clogging the roads, and no obvious street or road rules being followed. Pass when you can, park where you can, and remember to drive on the left side of the road! It was crazy, but fun. We felt safe with Danny in control. 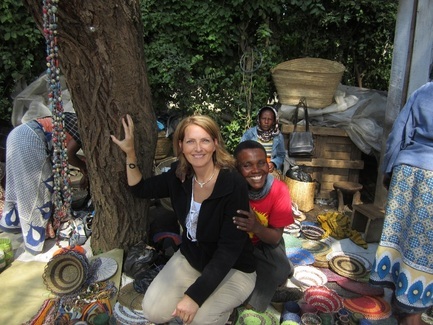 After exchanging cash, we headed to the Maasai Market. We were correct in assuming it would be much like shopping for souvenirs in Mexican and Jamaican markets. Everyone has something to show and offer and prices start at about double what you think they should be. One Maasai woman caught my attention by offering to teach me how to weave a bowl with the beads and wire she was using. She gave me a stool to sit on and showed me the details that go into the bead work. All those tiny beads! We ended up buying some jewelry from her. We also bought some paintings and wood carvings from the Maasai Market. We are not much for price haggling, and I'm sure we paid more than we should have, but we're ok with that. Time is money, and we got in and out fairly quickly, so we felt content with what we got. After shopping, Danny took us to a local soccer game where the A2T team was playing. We got to meet Michael, the A2T owner based in Arusha. Brian and Karen are the A2T owners based in St. Paul, MN. It was nice to meet their other half! Jet lag caught up with us around dinner time, so we made it an early night and headed back to the African Tulip for an early night. We had a lot of adventure ahead of us yet! After breakfast on Saturday morning, we headed out, making our way to Tarangire National Park. It was a 2 hour drive down a pretty decent highway. Along the way we saw many Maasai villages. Danny explained the culture as we drove. The number of wives a Maasai man can have relates to the number of cows he has. He can have one wife for every ten cows. In his family village, each wife has her own hut. Driving, would could see little villages of 3-6 huts, fenced in with cows. The more huts, the more wives and cows. As we got closer to Tarangire, we began to spot some wildlife. The first critters we saw were ostrich. Ostrich! Just out there near the field, walking around. Soon after we found some wildebeest, then zebra. It was (and still is) surreal. These wild "zoo" animals were all over, just wondering around, free as can be, without fences or boundaries. It felt very "Disney" at first, like a real life Jurassic Park. It was difficult to grasp the reality of it all. We stopped at the park entrance so Danny could get us checked in and registered before we could enter. We took the opportunity to run to the restrooms. Bad idea! This was our first encounter with true “bush” bathrooms. Coming from the States, we had a different standard of clean and sanitary and comfort, and are also used to real toilets and plumbing. Rather than repeat the bathroom horror experiences we had at every stop, let’s just make it clear here now. The bathrooms are icky. You’re lucky if you get more than a hole in the ground. Ladies, practice your squats at home before you go and bring your own toilet paper and hand wipes and sanitizer. I packed a gallon size ziplock baggie with a flattened roll of toilet paper, wet hand wipes and a bottle of hand sanitizer and believe me, we used it! I saw a lot of squeamish women looking very hesitant to use the toilets. Just go in, get your business done, and get out. The next best option is squatting behind your safari truck along the road somewhere. It’s part of the experience. You’ll appreciate your commode when you get home. As we left the ranger station and entered the park, we immediately spotted animals. It was like the animals knew the park boundary was there and they were safe as long as they stayed inside the lines. There were zebra, giraffes, wildebeest, warthogs, monkeys, elephants and a millions different kinds of birds. If we didn’t know better, we would have thought that we had just entered Disney’s Animal Kingdom. Seriously, it was like a real life Jurassic Park…. safari vehicle, driving around, waiting on the road while herds of elephants crossed. It was surreal. It still is. 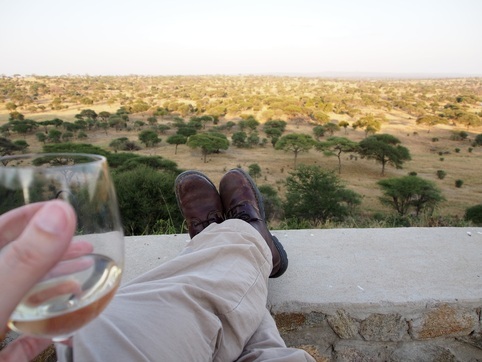 Tarangire Safari Lodge is a very special place. An open air, thatched room lodge sits center on the property with a row of semi-permanent tents to one side and a row of bungalows to the other. There is power in the morning and evening for a few hours each. Inside the lodge is a bar and lounge and a dining room. Outside the lodge is a huge patio area with expansive views of the river and wilderness. From the patio, we could see all the animals below; countless impala, elephants, giraffes, wildebeests, zebra, etc. We would sit on the patio after a day of game driving, enjoy a cocktail and watch the sun set. It was perfect. Every night at 6pm they would serve popcorn and light a bonfire. We could sit for hours and watch the ever changing views. The camp was incredible. The tents were just the right size, rugged enough to feel like we were on safari, but filled with everything we needed to feel comfortable and safe. The best thing was how close to the animals we were. There was a pack of baboons that ran through camp and caused quite a ruckus. Boy, they are loud! We had impala between our tents each day and vervet monkeys playing on our porch. Every night, we could hear the lions calling out their territorial threats. It was a chorus of grunts and roars. Sometimes they were so close, and I’d squeeze my eyes shut and pull the covers up to my nose and pray. It took a few nights to finally be ok with the loin noises. Now, I miss them. We did a Guided Bush Walk with an armed ranger carrying a 375 rifle. He met us at the park entrance and took us for a walk off into the park for 2 hours. We enjoyed the different perspective that being on foot gave us. We were eye level with zebra and wildebeest and warthogs, looked at footprints, droppings (ha, like a big pile of elephant poo is a “dropping”… more like a truck load!) and other small things you miss from the trucks. Very interesting. That night at Tarangire Safari Lodge, we were woken up to the sound of branches and sticks snapping and breaking. Flashlights were shining around behind the tents. We couldn’t see anything but the occasional light, but then, we heard it; the unbelievably loud and bellowing sound of an elephant rumbling and trumpeting as he was being shooed on down the path. The herd had been right behind our tents, passing through camp. What a cool thing to hear! It was a little scary but very exciting and one of the great experiences of our trip. We did a Night Drive in Tarangire, organized by the lodge. We piled into an open air vehicle and drove into the night for 2 hours. Again, we had an armed ranger with us, and a spotlight. As we drove, the ranger would shine the light back and forth looking for eyes. There were a lot out eyes out there! We saw the typical zebra and wildebeest, but also some fox, jackyl and a rare African civet. It was a fun drive. After 3 nights, we said goodbye to Tarangire and headed for Ngorongoro Crater. On our way, we stopped at a village (I think Karatu) to learn about life in Tanzania. A local guide took us through the village, explaining everything from their banana crops and vegetable gardens, to their irrigation systems to their school systems to their socialism way of life. Possessions are shared with the entire village. If you get a water spigot, the entire village uses is. It’s how they operate. As we walked, we passed a large group of school kids heading to lunch. They were so intrigued by Sydney’s super long straight hair! They touched and brushed it, and really took notice, which made Sydney a bit uncomfortable (understandably!) but it was one of those experiences worth remembering. We watched as villagers cut and shaped logs into amazing pieces of art (which be bought) and carry on with their daily lives. We were treated to a delicious lunch of local Tanzanian food, all garden fresh and very, very good, cooked on a fire burning stone stove. We definitely didn’t go hungry in Tanzania! After lunch we headed to a local “bar” (a 6x6 hut with a bar height counter in it) to try a banana beer. There is so much tradition in banana beer! I have to be honest, we were really hesitant about this village visit and almost cancelled it, but it was good. Glad we did it! The Ngorongoro Crater is a sunken volcano. In fact, it is the largest intact volcanic caldera, unflooded and unbroken, in the world. The view from the crest of the crater provided us with an expansive sight of the entire crater that spans 260 square kilometers, or 161 square miles. It is approximately 12 miles across, and 1968 feet deep. You literally drive up the outside of the volcano, like a jungle mountain, reach the crest, then descent down to the crater floor, which is a savannah. The crater lies within the Ngorongoro Conservation Area. The NCA is a unique protected area where the conservation of natural resources is integrated with human development. Local tribes abound in the area. The relationship between the Maasai tribe and the Ngorongoro eco-system is impressive. The Maasai tribes herd their cattle into and out of the crater daily for water, leading their cattle to water alongside the wild animals. Hundreds of individual Maasai villages dot the landscape as you drive. Seeing a farm with 6 small round enjaks, or mud and stick huts, tells us that the Massai has 5 wives. Each wife builds her own enjak. We passed several young Massai warriors (about ages 12-20) heading to a ceremony to celebrate their recent circumcision. We didn’t go into the crater the day we arrived there since we wanted to take advantage of a full day there. 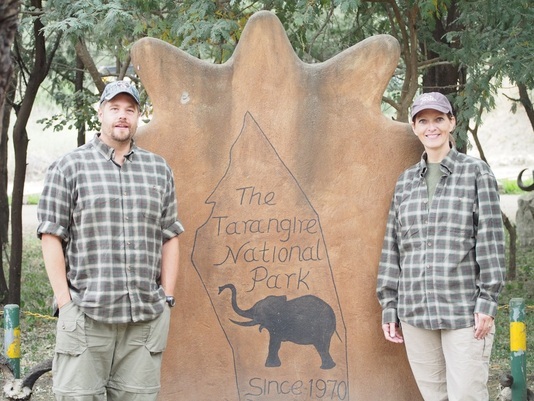 Instead, we checked into the Rhino Lodge for the night. The Rhino lodge was about 10 minutes from the crater descent road and was a very good choice for us. We had planned to stay at the Ngorongoro Crater Lodge, and pay the premium for being right on the rim, but I’m so glad we didn’t! Yes, you get the view from there, but the animals are often too far away to spot much from the rim, and there was a hazy, dusty glow over the crater from the top. During the day, we were out and about, so at night, when we would have been at the lodge, we wouldn’t have been able to see the view in the dark anyhow. It was cold on the rim, so I’m really glad we didn’t go a tent! The rooms at the Rhino Lodge were simple, but the dining room and bar areas were wonderful and the staff was amazing! We sat by the fire pit on the deck and watched water buffalo and a waterbuck in the yard. Our two nights here were very comfortable. We got up early to descent into the crater. Herds of zebra, wildebeest and buffalo greeted us. It is here that we got our first up close view of a lion pride. We watched several females with cubs right next to the road and a huge male off in the distance. We also spotted a rare serval cat. Danny was very excited, saying he has only seen a serval a few times. We enjoyed lunch on the shores of a hippo pool. It is fascinating to think that all these animals share this crater home. It’s the perfect balance of predator and prey, food and water, life and death. After our full day in the Ngorongoro, we hiked the crater rim. It was an uphill battle, but the views from the top were incredible. We could see across the entire crater from where we stood. Well worth the effort! Another early morning found us on our way to the great Serengeti. On the way, we stopped at the Olduvai Gorge. Olduvai Gorge is known as the cradle of mankind. Layer upon layer of volcanic deposits were laid down in orderly sequence over a period of almost two million years, making Olduvai Gorge a remarkable site that documents ancient life. It is here that Louis and Mary Leakey discovered ‘Nutcracker Man’ after nearly 30 years of excavation. It is one of the most important paleoanthropological sites in the world and has been instrumental in furthering the understanding of early human history. The museum on site is pretty simple, but the lecture we listened to was interesting. It was worth the hour we spent there. Entering the Serengeti was awesome! The Serengeti is the setting for so many wildlife documentaries with good reason. We saw a very impressive array of wildlife. The Serengeti boasts a staggering 8,500 giraffe, 10,000 eland, 200,000 zebra, 1.3 million wildebeest, 1,500 lions, 1,000 elephants, 280,000 Thompson’s gazelles, 25,000 buffalo, 500 species of birds, 72,000 topi, and 32,000 Grant’s gazelle. I think we saw them all! We stayed at the Serengeti Wilderness Camp. It was amazing!!! Serengeti Wilderness Camp is a seasonal camp located in the heart of the Serengeti National Park. 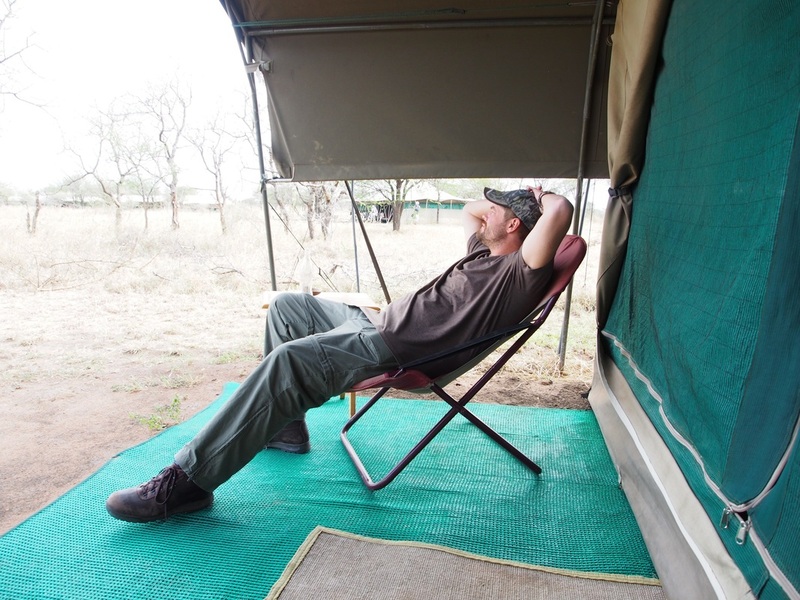 Seasonal camps have the benefit of being able to move to some of the best game viewing areas of the park. These camps move every three to six months to a new location. They call the style of camp “simple” but it was absolutely incredible. Each of the 10 tents has a covered front porch with lounge chairs, a bedroom with a real bed with a frame, mattress and headboard, and a bathroom with a military shower (bucket of hot water overhead), sink and vanity area and a toilet. Lighting is by 12-volt solar powered lamps. There is one large tent which was used to reception and a gathering place, with sofas, chairs, booked, tables board games, bar, refrigerator and refreshments. There was another large tent used as a dining room. Dining tables were configured to match each safari group, so we always had a table for 5 to accommodate us and Danny. Food was delicious. Service was impeccable. We absolutely loved the Serengeti Wilderness Camp. From the impressive 5 star welcome (cool towels, fresh mango juice, luggage handling) to the wildlife viewed from the front porch of our tents, this camp was perfection. During the night we would hear zebras right outside out tents, pulling grass and chewing. By this time in our safari, we were accustomed to the night noises and gladly welcomed them. It is one thing to see the animals, but quite another to hear them. The Monkey Invasion – soon after entering the park, we were stopped along the road watching some elephants. We noticed a few vervet monkeys hanging around. From behind me, Riley whispered, “Mom, there’s a monkey on our truck!” Sure enough, he was sitting on the edge of our pop-up top, looking in. We were surprised, and didn’t know what to do! Before I could grab my camera, the monkey hopped in, dug into Riley’s car seat pocket, grabbed the pack of shortbread biscuit cookies Riley was saving for later, and ran off with them. From then on, we made sure cell phones, ipads, cameras and everything else was securely stowed away! 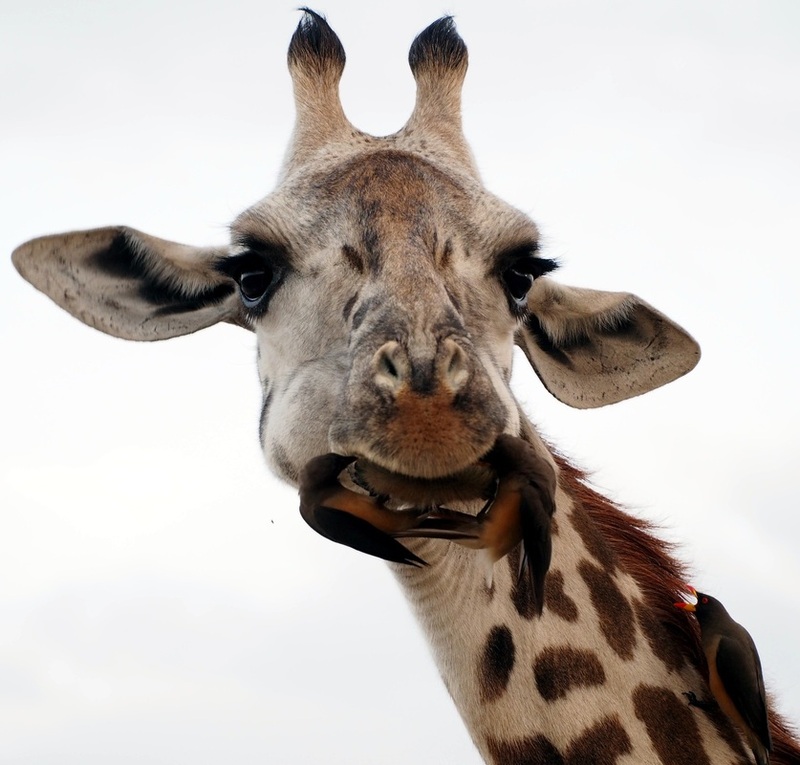 The Giraffe and his Friends – the road to our camp was always full of giraffes. We always stopped to watch these gentle giants. While stopped one evening, one giraffe came right up to the truck to check us out. We noticed that he had a flock of birds grabbing bits of food right out of his mouth as he chewed. The birds were hanging on his neck, head and face and enjoying the free buffet. The giraffe was very intrigued by us, and took his time looking at us, almost sticking his head right into the truck. It was a very neat interaction. The Gazelle in the Tree – Gazelles don’t belong in trees!! Seeing a full gazelle up in the tree baffled me. In my head I know it was killed by a cat (most likely a leopard) and hauled up into the tree for safe keeping, but the sight of a gazelle up in a tree was just bizarre. The Hunting Lioness – We spotted a lone lioness stalking a small herd of Thompson’s gazelles. We slowly followed her as she made her way through the tall grass towards them. I had told Danny from the beginning that the one thing I didn’t want to see was a kill. I knew I could close my eyes, but was afraid that I would never forget the sounds. But after being on safari for so long, the idea of a hunt excited me, and I was no longer opposed to witnessing it. So, here was our chance. I would be brave and watch nature unfold before me. However, the lion was spotted. The gazelles ran off. Oh, but wait. What’s that? Ooooh, a warthog! The lion resettled her attention on the unsuspecting warthog and began stalking again. Great. I was coming to terms with the lion killing a gazelle, but I know how pigs scream and carry on, and I knew if the lion got this warthog, it was going to make a terrible noise. I braced myself and watched. The lioness got about 20 feet from the warthog before she was spotted and gave up. It was sure exciting to watch, though! 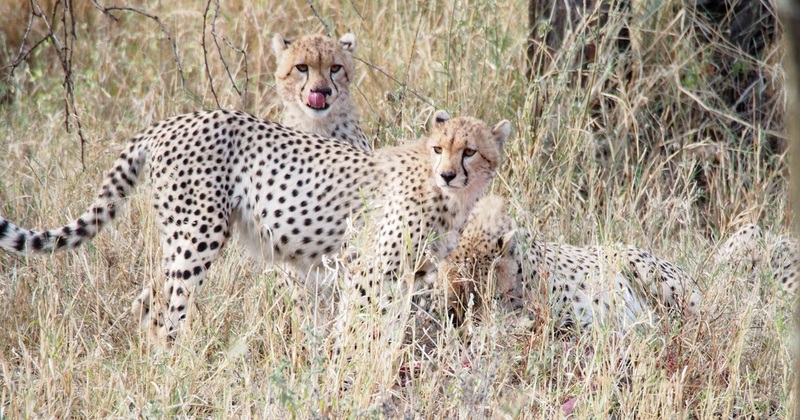 The Cheetah Family – A mom and three juvenile cubs (nearly full grown) made a kill right next to the road. We couldn’t tell what they had (impala? gazelle?) but all four of them circled around the carcass and ate their fill. The Leopard’s Lunch – At first we just noticed another gazelle in the tree. Then we noticed the leopard. 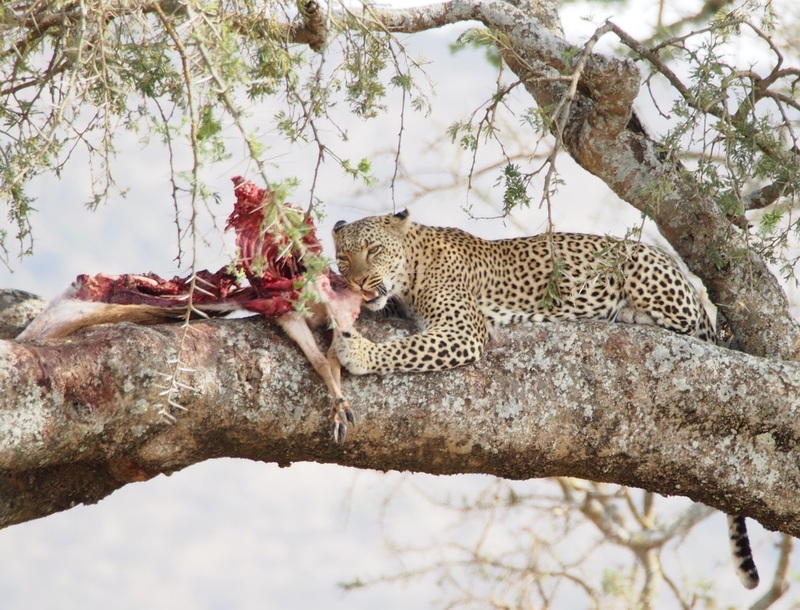 It was impressive to watch the leopard climb up into the tree and eat the gazelle he had dragged up there. We were we close enough to hear his claws scratch and cut into the tree bark as he climbed. At one point the gazelle almost fell out of the tree, but with the swipe of one giant clawed paw the leopard grabbed it and secured it in the branch again. Nom, nom, nom. The Baby Elephant That Could – Every baby animal is cute, and we were loving the baby elephants. So little and clumsy, and so protected by their herd. We were parked, watching a herd meander across the road in front of us. The large animals had no problem stepping up onto the berm on the far side of the road. One baby, however, was just too small to make it. He tried and tried but just couldn’t get over the edge. An adult elephant came around and lined up behind the baby and gave it a little push to help it over the hump on the side of the road. Awe. I remember the moment that our safari was done. We had spent the morning viewing lions, leopards, cheetahs, hippos, elephants, giraffes, etc. Literally every animal greeted us one last time and we were blessed to see such incredible things all in our last 4 hours in the park. But having to make that decision to say, “we’re done” was difficult and emotional. We wanted just one more game drive, one more memory, one more inspiring moment. We were not ready to leave yet. It meant saying goodbye to Danny, whom we came to love and accept into our family. It meant saying goodbye to the animals we spent countless hours just sitting and watching. It meant no more lion roars at night, or munching sounds in the morning, or crazy zebras making even crazier noises as they run around wildly. We needed to say goodbye to a place that will forever be in our hearts. Africa is often coined a “once in a lifetime trip.” There is no doubt in my mind that we will return. The bonds and memories we made in Tanzania are burned into our minds and hearts and will be cherished. 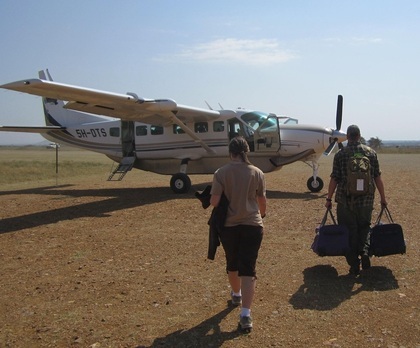 Because we were so far into the wilderness by the end of our safari, we planned a flight out from Seronera back to Arusha. Danny drove us to the airstrip, where we gave hugs and said our tearful goodbyes. 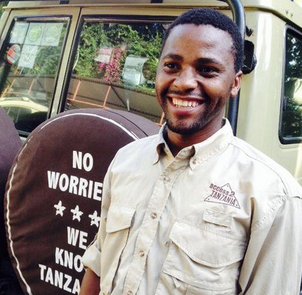 He needed to drive the safari vehicle back to Arusha, which was going to take him 8-9 hours. Our trip back was a 55 minute flight on a 12 passenger Cessna Grand Caravan bush plane. We literally took off from a dirt air strip. Pretty cool! We landed in Arusha and spent the day back at the African Tulip where we started. After a hot shower, a hot meal and some repacking, we headed back to the Kilimanjaro airport to begin our long 24 hours of flights back to Minneapolis. You know it was a good trip when you look back and can’t think of even one thing you’d change or do differently. It was perfection. Bring a baby receiving blanket for each traveler. Use it on the plane to cover your face while you sleep. Also, use it in the safari truck to cover your camera as you drive along. It’s very dusty! Bring a baggie with a flattened roll of toilet paper and wet wipes from home. Also bring hand sanitizer. Bathrooms are icky. Ladies, prepare to squat. There was often no more than a hole in the ground. Bring a simple stocking hat and lightweight gloves. Mornings can be cool and a hat will keep your core temp comfortable. Bring a cheap shower cap. The water pressure and quantity isn’t always good. Instead of washing hair every day, put it up in a cap and just wash your body. Wash your hair when you have access to a good shower. We also brought a dry shampoo to help between washes. If you have seasonal allergies at home, bring your allergy meds with, even if it is off season at home.